Dyson’s top-rated upright vacuum . The Dyson DC65 Animal Complete has updated its Radial Root Cyclone™ Technology to increase suction power. The motorized brush bar makes this model ideal for removing pet hair and has 25% more power. For delicate rugs and hard floors, the brush bar can be turned off. Dyson’s new lightweight upright ball vacuum is ideal for those who want a powerful vacuum that doesn’t lose suction, but also don’t want to have to work with a heavy floor-cleaning machine. Equipped with the latest Dyson Ball technology, this upright vacuum cleaner sits on a ball for easy twisting and turning around furniture and obstacles. This version is Dyson’s best vacuum for pet hair. The new cleaner head on the DC65 Animal Complete self-adjusts which gives you more suction power. The DC65 Animal Complete version includes an air-driven Tangle-Free Mini Turbine Tool to clean upholstery, cars, and stairs of dust, dirt, and pet hair. Removes pet hair without tangling. The Dyson DC65 has an ergonomic handle that’s designed and positioned for comfortable carrying, as well as a quick draw telescope reach wand which expands to reach for stairs, drapes, upholstery, and more. Total reach from the power outlet is 51.7 feet. HEPA filtration prevents dust and dirt from polluting the air while you are vacuuming. Hygienic and quick to empty: just press the button and avoid contact with the dirt. 35 foot power cord. Includes a 5 year warranty. Another appeal of this vacuum is the lifetime filters that don’t clog. This vacuum was certified by the Asthma and Allergy Foundation of America. 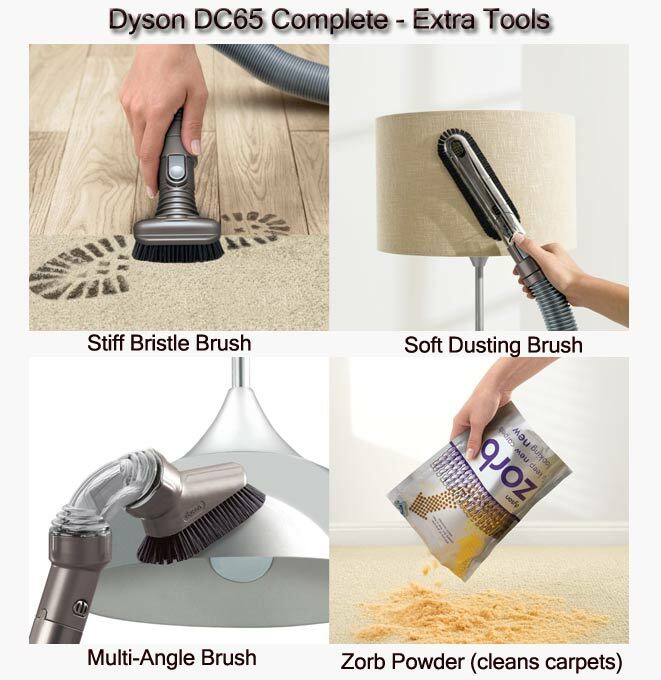 The DC65 Animal Complete comes with an extra tool bag which includes a Stiff Bristle Brush, Soft Dusting Brush, Multi-Angle Brush, Zorb Powder , a Combination Accessory Tool, and a Stair Tool. Upgrade Features from the DC41: The new Dyson DC65 has 25% more brush bar power to better clean carpets, reconfigured brush bar for better edge cleaning, suction increased to 245 airwatts. DC65 Vacuum Cord Length: 35 feet. Smart-Review Commentary: The top rated Dyson DC65 Animal Complete is one of Dyson’s best upright vacuums for pet hair. Dyson Radial Root Cyclone™ technology and the Lifetime HEPA Filter capture microscopic pollen, mold, and bacteria so that you don’t breath in what was in your carpets. Very little dust or dirt actually makes it to the filter, so they don’t clog, and you don’t have to clean them often. This vacuum is suitable for those with allergies to dust and mold and is certified by the Asthma and Allergy Foundation of America. 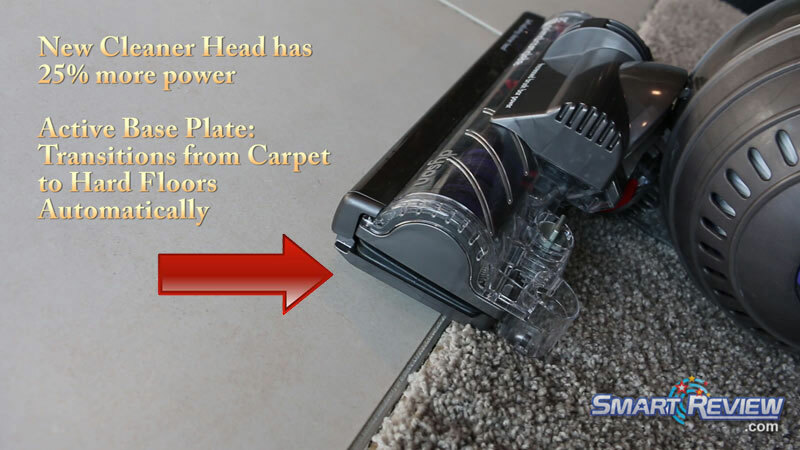 The new reconfigured motorized brush bar helps remove deep down dirt and pet hair from carpets (25% more power), while the latest Ball™ technology allows you to effortlessly move the vacuum around furniture and other obstacles. 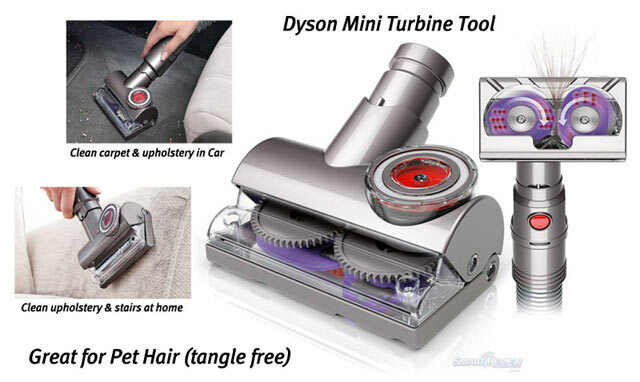 You can use the upgraded included Mini Turbine Tool (“tangle-free) to remove dirt and pet hair from smaller areas, such as stairs, inside your car, and furniture. This newer turbine tool now uses counter-rotating wheels to prevent pet hair from tangling the brushes. The Dyson Animal “Complete” upright vacuum now includes an extra tool bag with many accessories, including zorb powder for pet stains. The telescoping wand and hose give you a long reach to clean stairs, walls, drapes, and ceilings. The DC65 is very durable, as it is made of polycarbonate, the same material used for riot shields. This model has received extremely high marks from professional reviews as well as outstanding reviews by consumers. We got a full demonstration of the DC65, and can attest to its capabilities (see our video below). This model is a Smart-Review top pick and our best upright in the bagless vacuum category for 2015. VIDEO: SmartReview.com got a comparison of the entire Dyson DC65 Line.